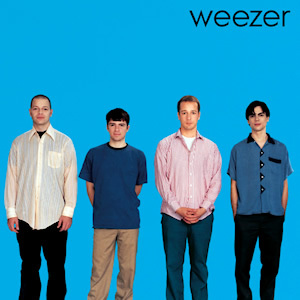 Twenty years ago this weekend, Weezer stormed into rock and roll consciousness with their potent, popular, and critically acclaimed self-titled debut, which has come to be known as simply the “Blue Album”. Over these past two decades, critics and fans have been contorting to place the group’s sound within a specific genre, with many coming up with blends that include 80s hair metal, 90s grunge, and punk with a “geek” element. No doubt, Weezer draws from these influences, but to my ears I hear more late sixties influence like the Velvet Underground and, especially, The Kinks in their structure combined with an early nineties inhibition which leaves it raw, unreserved and honest. Formed in in Los Angeles in 1992, Weezer is led by principle songwriter and vocalist Rivers Cuomo, who had already composed some of the material on this album prior to the band’s formation. ue their lack of a definitive genre, they were not initially well received by an L.A. club scene which was in the thrawls of a love affair with grunge rock. Undeterred, the band self-produced a demo known as “The Kitchen Tapes” to try to create some buzz, which they eventually received and were signed to a Geffen Records subsidery in mid 1993. While the band pushed for self-producing their official debut, the label wanted an established producer. Former Cars frontman Ric Ocasek was eventually enlisted and helped guide band to find a “brighter” sound. For their part, the quartet prepared for the studio sessions by practicing vocal interplay and barbershop-styled songs, as is evidenced in the non-album track “My Evaline”. Bassist Matt Sharp developed a falsetto-style backing vocal, which ultimately enhanced the material’s sonic depth and mood. Once the group arrived at Electric Lady studios in New York, some of their inital tracks were cut for the better quality ones which came later. These include the songs “Lullaby for Wayne”, “I Swear It’s True”, “Getting Up and Leaving”, and “Mykel and Carli”, which are all included in the deluxe edition of Weezer, released ten years after the original. The album got it’s nickname from the simplistic album cover featuring the band members lined up in front of a plain, blue background. This cover is actually an example of early Photoshop, as guitarist Brian Bell‘s head was added to a pose by original guitarist Jason Cropper, who left the band during recoding of the album. Cropper’s only songwriting credit is on the opening track, “My Name Is Jonas”, which quickly alternates between the folk-influenced picked acoustic notes and the thumping electric chords all while drilling in certain riffs and themes such as; “the workers are going home”. There is a slight harmonica lead late in the song before it comes full circle to the acoustic in the dissolve. The next two tracks are thematically linked with “No One Else” being about an obsessive relationship and “The World Has Turned and Left Me Here” about the aftermath when it’s over. The latter song contains a blend of electric and acoustic riff during the intro and remains steady throughout, methodically and precisely delivering the message of isolation and delusion in the wake of heartbreak. The most popular song on Weezer is Cuomo’s “Buddy Holly”, a short and sweet song with a plethera of pop culture references lyrically and plenty of sonic riffs on guitars and keyboards. Cuomo was originally against the song’s inclusion on the album, saying it was “too cheesy”, but Ocasek saw its potential and lobbied hard for it’s inclusion. The result was a melody-driven tune which reached #2 on the mainstream rock chart after it was released on the 58th anniversary of Buddy Holly’s birth. “Say It Ain’t So” is another top-notch song with funk and soul verses before the slow, grungy rock riff dominates for the chorus hook. The tune later seems to advance to a new level through the middle section with deeply personal lyrics and dualing lead guitars. Very popular among fans, “Say It Ain’t So” is a signature Weezer tune. “Only in Dreams” is held down by Sharp’s bass riff with some light and surreal guitar textures throughout. This song has the least amount movement of any but does finish the album aptly with a clear and indelible message. Peaking at number sixteen on the album charts, Weezer has gone multi-platinum since its release. They followed up with another fine effort, Pinkerton in 1996, and have gone on the release several more successful albums through the past two decades. 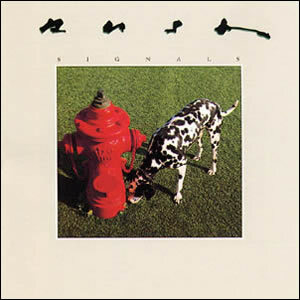 Signals was the much anticipated ninth album by Rush, as it followed up the blockbuster 1981 album Moving Pictures. This album would be the first where they would depart from the band’s classic sound and migrate towards more “modern” genres of new wave, reggae, ska, and synth-driven pop music. When the album was finally released in September 1982, it was a bit of a disappointment for many of the longtime fans who grew up with Rush’s classic sound and had really hoped the band would up the ante following the fantastic Moving Pictures with an even better album. They didn’t and it was not. That being said, Signals is still a very good album. It would also establish a pattern of disparate songwriting, such as one song that was the product of drummer Neil Peart jamming with some of the road crew, one with differing parts written by each of the three band members at completely separate locations, and one that included a sequenced bass and guitar part that producer Terry Brown so strongly objected to that he would never again produce a Rush album. Rush had begun to experiment with synthesized technology as early as 1977’s A Farewell to Kings, when bassist and lead vocalist Geddy Lee played short synth parts. On subsequent albums the band slowly implemented more electronics, such as foot pedal triggers, to explore more complex arrangements while maintaining their core sound. On Signals, the band brought the synthesized sounds to the forefront, ushering in a new sound for the band which they would explore through the rest of the 1980s. Unlike those later albums, however, this album maintains a rock edge tinged in various sub-genres, which make it a unique and interesting listen. Guitarist Alex Lifeson is still very strong on this album as far as providing the predominent musical melodies. Further, the lyrical content on this album was a far cry from the deep, philosophical epics of the band’s past. More contemporary and accessible topics were explored such as teen repression, peer pressure, old age, and modern professions. The song “Countdown” was the earliest written for this album, just months after the release of Moving Pictures. The band were invited to a V.I.P. viewing of the launching of the very first space shuttle, Columbia, in Florida in April 1981. This event would be the inspiration for the song which describes the launch in detail along with audio clips of some of the radio talk recorded during the maiden flight. The song, which closes the album, was later used as a “wake-up” song for astronauts during future space shuttle missions. “The Weapon” is a solid song, musically, which includes some sequenced parts and acts as another part in Peart’s disparate trilogy called “Fear”. The album’s opener, “Subdivisions” is the most enduring song on Signals. This is especially due to the fantastic drumming by Peart, who stands out here more than anywhere else. With the advent of MTV, the band would produce their first music video for this song, which carries a duo meaning, exploring adolescent social constructs as well as urban geographical layouts. Lee also shines, with solid and melodic vocals topping a performance on synthesizer that includes two solos done on a Minimoog and interspersed bass guitar parts. The song where Rush sounds the most like its old self is “The Analog Kid”, especially during the hyperactive intro riff and verses. Lifeson provides an excellent solo which introduces a climatic outro to the song. Both “The Analog Kid” and “Digital Man” were later reborn as characters in the 2004 comic Common Grounds. “Digital Man” has a reggae-based backing, which was a sore spot for Brown who was reluctant to leave behind the band’s past sound, while the band members wanted to explore such new musical directions. This song contains some of the most interesting bass playing on the album. “Chemistry” is probably the weakest song on album, but an interesting “experiment” nonetheless. Each member wrote a different part of the song, including lyrics, from remote locations prior to the album sessions. The song was then compiled in sequence. It would be the last time to date (30 years and counting) that Lee or Lifeson would contribute lyrics to a Rush song. “Losing It” is another experimental song, bringing in a guest violinist Ben Mink on violin. The song is soft and melodic with calm virtuosity and melancholy lyrics and a writer and a dancer past their prime. Lifeson’s dramatic lead greatly enhances to the overall tension of the song. “New World Man” returns back to the reggae influence, fused nicely with solid, new wave rock beats. the song became a surprise hit single for the band, peaking at #21 on the Billboard charts, the band’s highest charting single and only top 40 ‘hit” in the US. The song was the last composed for the album song on the album, as their goal was to write a song between 3:40 and 3:50 in length to keep the “sides” of the album fairly even. The song was written and recorded on the same day. The album itself reached #10 on the Billboard album charts and was certified Platinum within two months of its release. The band then embarked on the biggest tour to date, criscrossing North America, Britain, and West Germany to support Signals through 1983.